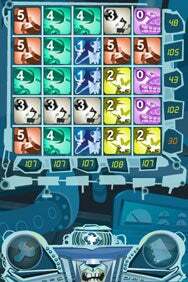 Robot Master is a ridiculously addictive $1 puzzler from Dr. Reiner Knizia and sold through Conlan Rios. Dirty 30: In Robot Master, your final score is the lowest total in any row or column. So that otherwise impressive board is marred by that unfortunate 30 in the bottom row. The game is more complicated to describe than it is to play. Once you understand the game, it’s delightful—and delightfully frustrating. Basic gameplay works like this: You’re presented with a five-by-five grid. On each turn, you’re presented with a card featuring a number from 0 through 5. You’re tasked with placing those numbers on the grid in any playable spot. Each row and column is summed to calculate its point total. But if you manage to get two of the same number in a row or column (say, two 3s), you’re rewarded with a 10x multiplier of that number (in this example, 30 bonus points). And if you go the extra mile and get a third of the same number in a row or column, a bonus of 100 points is added to that row’s score. Once you fill up the grid, the game ends. That’s where the final kicker comes in: Your final score is the lowest row or column total you achieved. Your worst line (in my case, often below 20) is your score, even though the average of the rest of your point totals may be in the triple digits. It’s tremendously aggravating to realize the last digit you’re dealt will leave you with a 12-point column when the rest of your totals are decidedly higher—but the good, fun, replayable kind of aggravating. Robot Master offers several different modes. In solo play, you can go the “easy” route (which lets you reject each card you’re dealt for another random one, but only once per turn), or choose “tournament” mode. In tournament mode, you must play the number you’re handed, and you can compete on a global high scores list. In “versus” mode, the game takes some major strategic twists. Playing against the computer, or a human opponent via pass-and-play, you take turns placing your cards on the same grid. One of you scores on the rows, and the other on the columns. This competitive version of the game is broken down into two clever options: In one, you know all of your 12 cards from the start; in the other, you start with just five cards and get a replacement after each turn. Versus play requires a decidedly different approach to the game, and the AI opponent is sufficiently evil and fallible in equal measure. Playing against humans hasn’t quite ruined any friendships for me yet, but you can expect to feel some fleeting hate for your buddies when you challenge them. Any one of Robot Master’s modes would be plenty. The combination of all these clever modes, paired with excellent artwork and well-executed sounds and music that suit the game well, makes for over-the-top goodness. I’m a sucker for any game that makes strategy and luck in that perfect, “sweet spot” ratio, and Robot Master does. This is perhaps the most fun a game can be in three minutes. Robot Master is compatible with any iPhone or iPod touch running the iPhone 2.2 software update.